Unreasonably fun and exciting mini pinball machine. You pull out a trigger to get the animated ball rolling, then use left and right flipper buttons to direct the ball, just like on a full sized table. 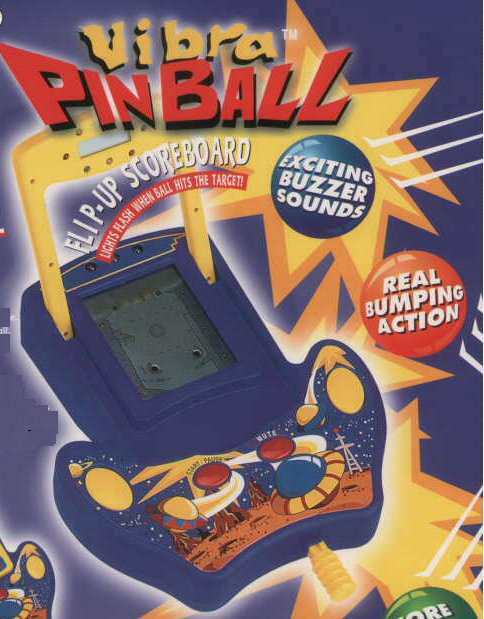 As you play and score the handheld electronic pinball game vibrates with the action. To keep you excited, there are different levels of gameplay, and a multiplayer option, so people can play together or take turns. To keep others calm, there is a mute button. Order and let us know where you would like your Vibra pinball game sent. Pinball Game text, images and video are copyright.